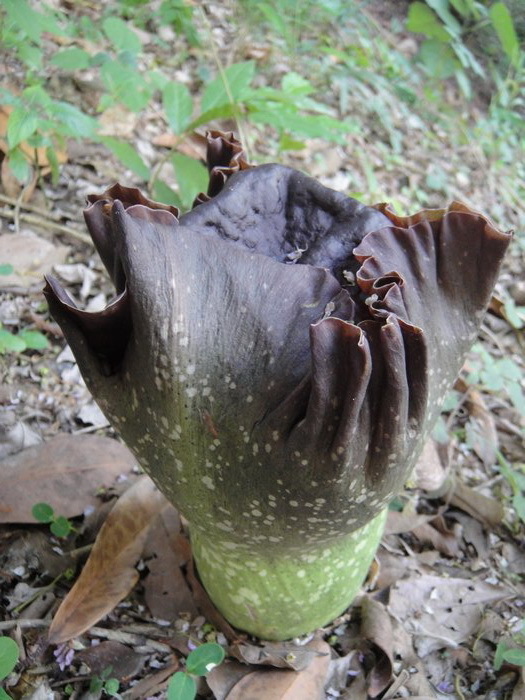 Amorphophallus paeoniifolius, the Elephant Yam or corpse plant, belongs to the Aroid family, Araceae.This plant produces a single inflorescence followed by a solitary leaf. The plant is deciduous, dying back to a large underground corm, weighing up to 8kg, after the growing season. When in flower it smells like a rotting dead animal, which attracts flies, the primary pollinator. 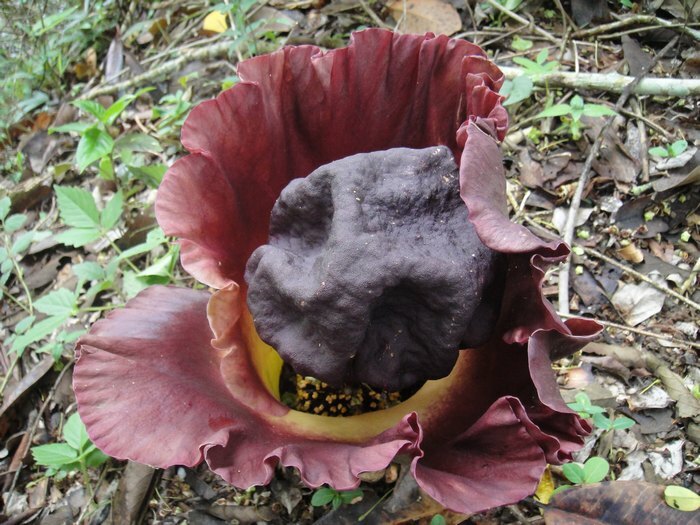 The huge, bizarre bloom appears from the dormant underground corm in March or April, then dies back as the single stem and leaf pushes up to its mature height of 6-7 feet. Amorphophallus paeoniifolius is perhaps one of the ugliest flowers (inflorescence) in the world and to accompany it is one of the worst scents that you can imagine. Its hard to get close to the flower when its releasing its perfume. Fortunately the foul odor only last for a few hours after the flower opens. The plant only blooms when mature and even so it doesn't bloom every year. Flowers last only about 5 days. Even more interesting, during this phase the plant generates heat which can be felt if you have the guts to stick your hand inside the inflorescence. The heat and the smell mimics an animal that has recently died to attract the flies that will pollinate the flower.